Metal Hip Failure and Metallosis. 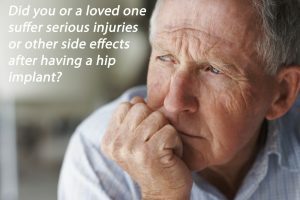 Many metal on metal hip replacement systems and metal hip components that were implanted have been linked to high premature failure rates and other severe complications. These metal on metal hip designs were touted to last over 20 years and provide greater mobility and patient functionality. Zimmer Hip M/L Taper failure Lawsuits. Sadly, many metal on metal hip replacement systems and hip parts that were implanted in recent years have been associated with high failure rates and other serious complications. Zimmer Hip M/L Taper failure Lawsuits. Zimmer is exposed to many lawsuits over the combination of the Zimmer M/L Taper Hip Prosthesis and Zimmer VerSys Hip femoral head. Recently, Donald Fletcher from California claims that problems following a metal hip replacement were caused by defects with the Zimmer M/L Taper hip components used during his procedure. According to Fletcher, the cobalt-chromium femoral heads are an unreasonable risk of harm to patients who receive the implant. Failing Smith Nephew Birmingham Hip Lawsuits gaining traction. As the U.S. population continues to age, degenerative hip joint disease from a variety of causes has become more common-place. Orthopedic doctors and hip implant companies over the past several decades of trial and error have developed metal hip designs that were supposed to last for many years. The latest incarnation of the metal implant is the notorious hip design of metal on metal hips (MoM) which have come under fire for premature failure, metallic debris, loosening, painful joints and the need for early revision and replacement. J&J DePuy Pinnacle Metal Hip. On the heels of the latest plaintiff multi-million dollar DePuy hip trial verdict, Johnson & Johnson (J&J), the world’s largest pharmaceutical company and medical device maker, and its DePuy subsidiary were back in federal court again. J&J DePuy Pinnacle Metal Hip. J&J and its DePuy unit are under fire over allegations involving its Pinnacle/Ultamet line of metal hip devices which are prone to metal poisoning and premature failure according to lawsuits. J&J and its DePuy unit, which makes the artificial hips, recently argued in the Fifth Circuit Court of Appeals that the verdict should be reversed because there was insufficient evidence that the hips were defectively designed and deceptively marketed. J&J DePuy Hammered in Latest Pinnacle Metal Hip Verdict. Johnson & Johnson and its subsidiary DePuy have been hit again in the latest Texas DePuy Pinnacle hip implant case to go to trial. Johnson & Johnson, and its DePuy subsidiary are under fire over allegations involving its Pinnacle/Ultamet line of metal hip devices which are prone to metal poisoning and premature failure according to lawsuits. A Texas federal jury slammed Johnson & Johnson and DePuy Orthopaedics Inc. unit with a combined $247 million verdict in the latest bellwether trial over DePuy’s Pinnacle line of metal-on-metal hip implants. Birmingham Hip Implant Resurfacing Lawsuit News. Over the past ten years, metal on metal (MOM) hip implants have been under fire over their increased risk of premature failure and serious complications of metal poisoning and localized hip soft tissue reactions causing pseudotumors. Birmingham Hip Implant Resurfacing Lawsuit News. 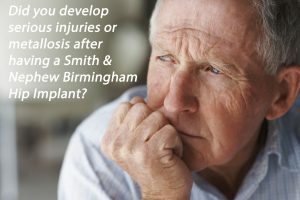 Smith & Nephew Birmingham Resurfacing implant premature hip failure is linked to an alleged design defect causing personal injury, metallosis, pain and need for risky revision surgery according to lawsuits. California Stryker LFIT V40 Hip Implant Failure. Larry Schneider from California recently filed a product liability and personal injury claim in the U.S. District Court for the Central District of California. California Stryker LFIT V40 Hip Implant Failure. Stryker LFIT V40 Hip Implants under fire over its line of metal hip devices causing metal poisoning, pseudotumors and catastrophic failure. According to Schneider, in his California Stryker LFIT V40 Hip Implant Failure lawsuit, the Stryker LFit v40 femoral head and Accolade TMZF femoral stem hip components were defective and unreasonably dangerous when used together.